Alfred BLALOCK chirurgien américain (Culloden, Géorgie, 1899 à Baltimore, 1964). 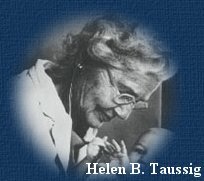 en collaboration avec Helen Brooke Taussig American paediatric cardiologist, born 1898, Cambridge, Massachusetts; died May 20, 1986, Kennett Square, Pennsylvania. 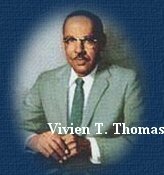 & Vivien T.THOMAS (1910 - 1985), a intervenir avec succés dans l'opération de la maladie Bleue (1945). Blalock had developed great expertise in vascular anastomosis in animal surgery and invited Taussig to work in his laboratory following discussions she had with him on her patients with Fallot's tetralogy. 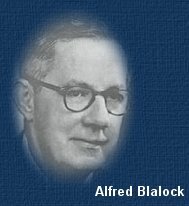 After many animal experiments, on November 29, 1944, Blalock and Taussig decided to proceed, and Blalock, with his surgical team and his invaluable assistant, Vivien T. Thomas, performed the first Blalock-Taussig operation on a patient with Fallot's tetralogy â€“ joining the subclavian artery to the pulmonary artery in a cyanotic child. The tiny child who had been at such great risk survived the operation and slowly improved.